We took a short trip to Sydney and while down there, took a tour with the guys at the Taste Food Tours. They had many different tours to choose from, but it was the Indian one that took our fancy the most. So early we set off from the Sydney CBD out to Harris Park. This rather quiet place was full of Indian restaurants and takeaways. So we knew we were in the right place. Our meeting place was Chatkazz; here we met our tour guide Gunjan. She told us that this area was the best place in Sydney to get yourself some authentic Indian food. So let’s see if she was right, and see if Harris Park lived up to her claim. 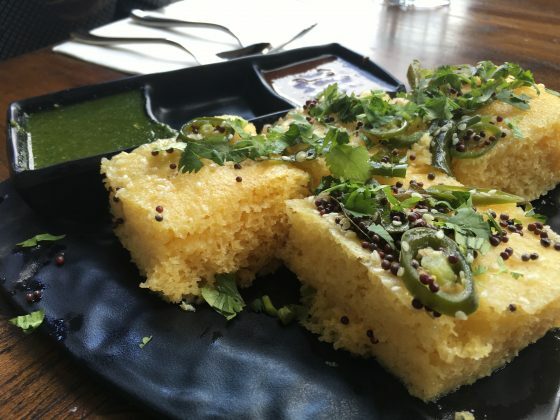 Here we sampled two dishes; we had a Dhokla, this was a Gujarati breakfast. to ferment was served with two dipping sauces; one was coriander and mint, the second was date tamarind. I must say I much preferred the date tamarind, not for a particular reason, just appealed to my taste buds more. Not soon after we had polished off this dish (I feel as at this point we had three other people on our tour, yes it was a very intimate tour. All the food you see below was not just for us) the second plate came out. This was called Aloo Baratha; this was a delicious potato and onion coriander leaf felling. This dish is more seen in the Punjab region traditionally, although this ; this with Ghee (clarified butter) and not the mint yoghurt, red onion and hot salsa we had with it (yes the salsa was enough to blow your head off). The second stop on this walking tour was a trip to the Indian supermarket. Here we were told about different spices, the copious number of popadoms, but more importantly was the fact that rice is red when it comes straight off the fields. It is then polished many times and given a chemical that gives off that aroma you get when cooking basmati rice (I know right, who knew!). So my favourite stop was the next one at the Chandni Chowk Indian TakeAway. A takeaway I hear you scoff at. You would be shamed into thinking so; this place had, in my opinion, the best dish of the day. This Pani Poori (found mostly in Eastern India), this was merely a potato, onion, chickpeas, coriander chutney stuffed crispy puri drenched in sour and spicy mint flavoured water. We got the water and the plate of Pani Poori and was like, how on earth are you going to eat that! This is where Gunjan came in. 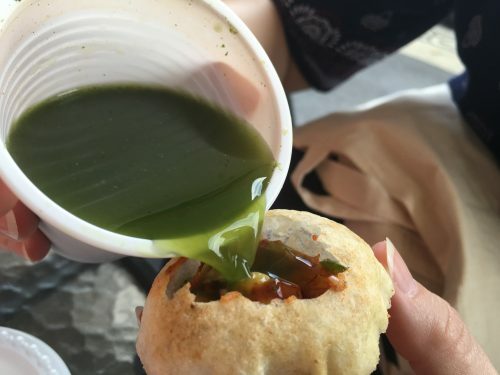 She showed us the best way to eat this, and to make sure that the liquid soaked through the puri. All I can say is, do not scrimp on the mint water. This is what made it for me; the refreshing liquid gave you a completely different texture in your mouth after your initial crunch. Just around the corner was the Taj Bhaven. 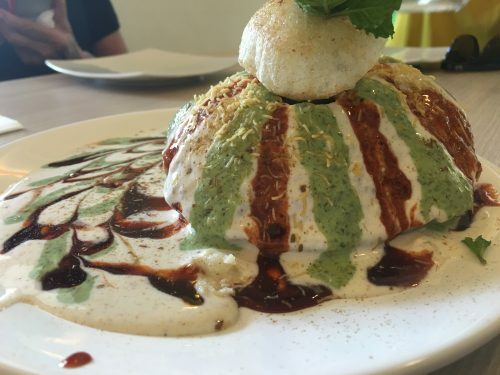 Here we sampled four dishes; the first was Hara Bhara Kebab which was filled with a mixture of greens topped with a cashew nut. This was then served with a mint yoghurt sauce and date tamarind sauce. Again, it was the later that I preferred. 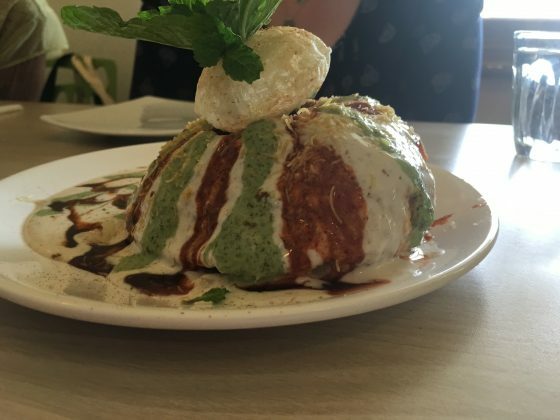 Well, the Raj Kachori was just an incredible sight to behold. 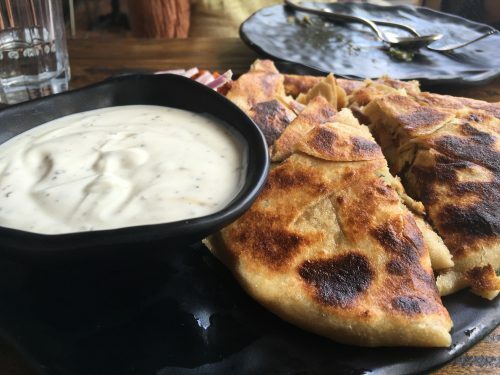 This was filled with potato, chickpeas, onions and some spices topped with a pani, along with some more of the date tamarind and mint yoghurt. Raj, I later found out means king. A meal fit for a king, yum. What came out next was Samba (Lentil Dhal), this is a southern India dish. This was probably my second most favourite dish. It included in the dhal, samba powder, turmeric, chilli, tomato. All this is then traditionally cooked in a pressure cooker. Not sure it was prepared this way here, could be wrong. This also came with a Utta Bam, this was fermented rice with a coconut chutney. The traditional way this is made is ferment the rice, leave over night, make into a paste and then again leave overnight before cooking (that’s one hell of prep time for a meal (generally eaten at breakfast time)). 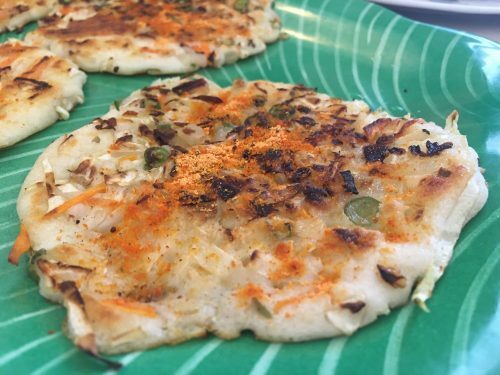 The spice used on top is called Mozhugu Podi (I hope that’s the spelling). By this point, we were both starting to feel full, but we still have two eateries left on the itinerary. 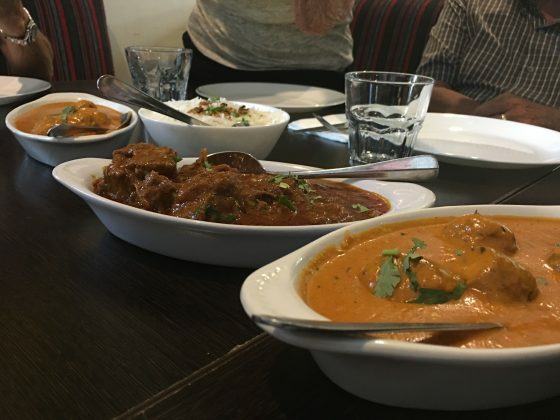 Our penultimate stop was at the Spice of Life, the food here was from the north or India with a Persian influence (much like the Indian we get back in the UK). 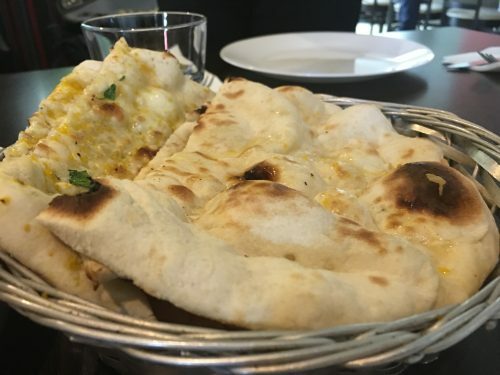 So here we had two curry dishes along with some rice and two types of naan. Before i carry on telling you about the food, I feel at this point; I have to point out that the reception we got from the young lady who served us was far from impressive. Her body language suggested she did not want to be there, nor did she seem interested in us being there (I also have to add that this was nothing to go with the guide we had of Taste Food Tours, this was one individual who worked at the Spice of Life restaurant). Ok, little rant over. We were served Masale dar Goat. Yes, that is the goat. Was not my favourite at all, seemed to have a lot of gristle and was not pleasant to the mouth. But, for all I know, goat is meant to be like this. 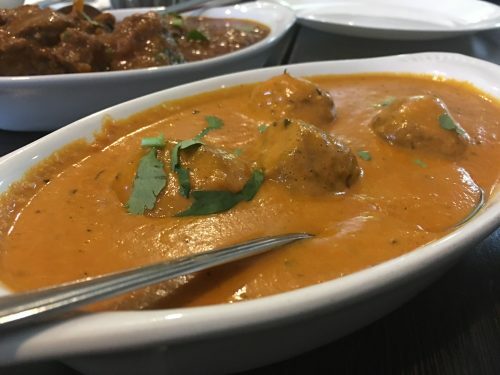 However, the second cry we had was called, Malai Kofta. This is a mix of cheese, potato, sultanas and cashew nuts. 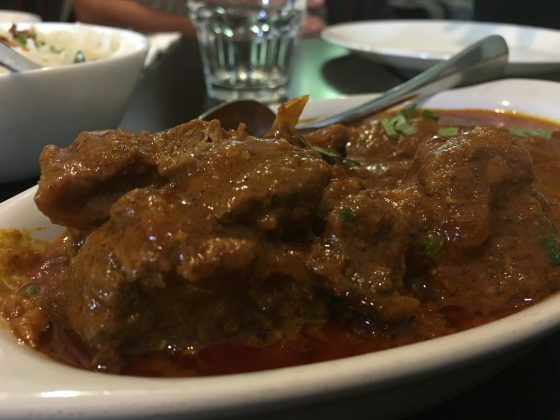 This is cooked in oil separately to the curry itself, only coming together just before served on the plate. This was delicious, and you certainly did not feel like you were eating a meat-free curry. This was all accompanied with some Rice and both regular and garlic naan. We were then told we had just one more place to sample on our tours. Dessert! Tina loves a good dessert, but we had heard that the Indian desserts were not to be desired. So with that prior conception, we headed to the Taj Indian Sweets and Restaurant. So you can see from the picture below, we had 5 sweet treats in total. These were, Boondi which was the little orange one. This was made of chickpea flour, and unfortunately was just a tasteless soft ball (strike one for the Indian sweets). The second was called Vara-Peda which was the grey looking one. This was quite nice and reminded us a bit like cookie dough. Kala Kand was the third one that had a silver top. If you like rose water, and the taste a Turkish delight gives you then you will probably enjoy this one. I, however, am not a fan, therefore, did not like this one much. We then had one that looked like orange spaghetti, called Jalebi was just like the Boondi. Finally, we had what was called a Badam Barfi; this had an almond on top. But disappointingly did not have much of a flavour. 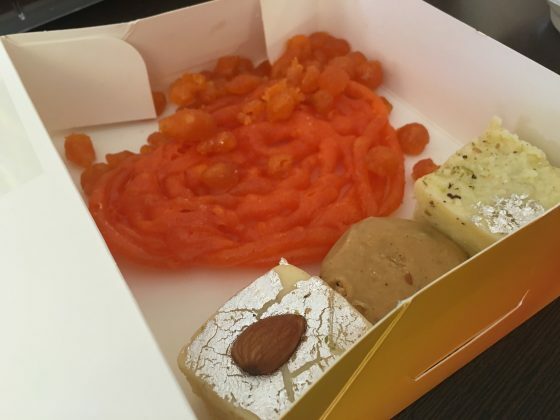 So all in all the little Indian desserts, unfortunately, lived up to our expectations. However, and it’s a big yet your taste buds of not the same as ours. So, would we book again? Most defiantly! We wouldn’t mind trying any of the Taste Food Tours that they have on offer. We certainly would get in touch with Lesley and get ready to sample some of the most amazing authentic Indian dishes you are likely to get anywhere in Australia.